Clay Collins is back with the latest update on his ever-evolving software, LeadPages. Good day, James Schramko here, welcome back to SuperFastBusiness. I hope you like the new site, we’ve even adjusted the font on the site to make it easier to read. Please let me know what you think about it. Now I’m here with a special guest, Clay Collins, who has been on this show more than any other guest. Welcome, Clay. Clay: James, it’s great to be here. What is this, number 5? Number 4? James: Oh, listen, probably a listener would know. it might be 5, or 6 or 7. The reason you keep coming back is you just keep moving so damn fast, like this LeadPages machine of yours, seems every single week I’m getting a new email with a new feature. What is going on over there? Clay: You know, I think that when we first started out in this business, we realized that there were so many applications that we’d just release a feature once, and then maybe every two years they’d launch a version 2.0. And we set out from Day 1 to create a software company that was engineered from the ground up and architected to create a release every single week. And our version of leadership is not blowing people away with fancy marketing per se or having a bunch of takeaways or this bonus is going away or you know, there’s this discount, buy now. We wanted to lead the market with true feature leadership. And so it’s been our agenda to come out with huge market-changing releases at least every quarter. So in 2013 we came out with LeadPages, but in December of 2013 we came out with LeadBoxes, and then in January of 2014 we came out with LeadLinks. Today we came out with a new form of Facebook integration, and our goal in 2014 is to actually even accelerate even more the rate at which we release sort of game-changing innovation. So we want to speed up, not slow down. James: Right. So is weekly releases the metric, or is it just popping stuff out as soon as you discover it? Clay: Yeah. I think that when we first started, it was about weekly releases. But over time, as we’ve grown, we’re now up to 35 people and around 15,000 customers, and we’ve had to be a little bit more deliberate. So it used to be that we only found out that a feature was ready when a developer told us the day it was launching. And now we have like quarter one release schedules, we know when things are going to come out, they’re specced out in advance, and we kind of had to grow up and become a real company. So there is a lot more planning that goes into it now, so I can no longer play naive about the product roadmap when people ask me when things are coming out. James: Right, I know we’ve talked about this before, the massive change in mindset going from the founder and having a couple of products to being… Like you’re on a machine now, you’re strapped to a rocketship and you’re on that ride. A couple of side points that I think is worth pointing out here. One is, what does it mean for you as the founder now in your day-to-day stuff? You mentioned to me earlier… because I got interviewed for a podcast you’re running, by a new guy you’ve got on board, Tim, who was fantastic. It seems you’re building a team around you to do a lot of the things that you might have been doing before. Clay: Yeah, I think that as we scale, one of the things I think we’re running up against is vision bandwidth. So I know that I want us to have an amazing podcast, but I don’t necessarily have a vision for it. I know that we want to have amazing customer support, but I don’t necessarily have a vision for that. I know that we need an amazing YouTube channel, we need amazing video production, there’s a whole lot of things we need, that I don’t necessarily have a whole lot of strategic vision around, but I know that they need to be awesome. And so we’ve kind of moved from a company that just scaled my thinking to a company that is really led by a group of thought leaders that are connected among their peers in their own circles and pushing the envelope in what they do. And one thing that I’ve noticed is… One realization that I’ve had recently is that as the CEO of the company, my number one job should not be marketing. So I still love being a thought leader, I still love contributing my ideas. But the number one multiplier in our business is the product. So our marketing can only work to the extent that the product is awesome. Our support only works to the extent that our product is awesome. So the product is the main multiplier in my business. So the majority of my time now is spent on vision around the product, innovation around the product, making sure that that continues to happen, and also scaling our marketing team. So just as a sidenote, we’re hiring a VP of marketing. So if anyone wants to apply for that, we’d love that as well. James: So tell me what a VP of marketing would bring to the table. What would be the things you’re looking for? Because I imagine a lot of the people listening to this podcast would be in the same space. Clay: Yeah. So I think a lot of businesses, at least that sell enterprise software, have scaled with a team of salespeople. So like the Fortune 100 company Salesforce.com, half of that freaking company are salespeople. And that’s largely how they’ve grown. And our approach is, as opposed to hiring salespeople, we’re hiring media channels. So again we hired someone only to do podcasts. We hired someone only to do webinars. We’ve hired someone to only do YouTube stuff and create videos for us. We hired a writer who’s only going to be publishing a split test a day from our data set. So we’re hiring media channels that can really do what they’re doing, and that’s sort of our emphasis. So I think the main focus of a VP of marketing is coordinating all these people who are in fact media channels in their own right, and creating a coordinated, content vision, to move the company forward. And then also they would be exploring paid media options as well, like Facebook ads and AdWords and stuff like that. James: I love watching the progression, because I guess in some ways I’m following in your footsteps, to a small extent, where I’ve started rolling up some of my brands into a superbrand. SuperFastBusiness is now the home of my community. It used to be FastWebFormula. I’ve also moved across BuyWithBonus to SuperFastBusiness. And I guess it’s just a matter of time until I start having people move from the back shadows where they’re editing podcasts and editing videos to having a front person or contributors who are helping with that marketing coordination. That’s a long term position I guess I could take with the brand. How much easier has it been for you since you went from the initial phases where you had a couple of different products? I remember you had, like, WelcomeGate is probably the first time I ever remember you, to then having LeadPlayer, which appears to be not for sale anymore, and then you went to LeadPages. So how much easier is it when you find your thing, when you get to that one focal point, compared to multi-products suite? Clay: Yeah, I think that in a lot of ways business is a jigsaw puzzle, and you kind of move parts around. And every once in a while, something just locks into place. And it makes absolute sense that it should be there. And when that locks into place, it makes it easier for everything else to also lock into place. And so, you know, it can take a while to get that first thing to lock into place, but then slowly but surely a whole bunch of other things in rapid succession also start falling into place. And so yeah, we did some stuff with WelcomeGate, we had LeadPlayer – we’re still supporting it, providing upgrades, providing bug fixes, absolutely supporting our customers there – but the main focus is LeadPages. And so when that got locked down, we took The Marketing Show, which was our blog, and made that blog.leadpages.net. And then we started realizing that there were actually certain content pieces that we could scale. So we played up with a whole bunch of different types of content. What we realized was that the best kind of content was videos about template releases, videos about new features, case studies around A/B split tests, showcases of landing page templates, and for the podcasts, doing explorations of conversion case studies. So we were creating these really scalable systems where we can reliably deliver content by following a proven format for different kinds of content. And we’re also following that around clarity we have around the product. We have absolute clarity about where we’re going. We’re not just sort of imagining it as we go along. There’s a mission that we’re trying to accomplish. And I would just say, the more that things fall in place the more they fall in place. And to your point about following in my footsteps, I don’t know. I’ve kind of seen this thing, in… I’ve no way no explain this, but like, there’s James Dyson, right? Works with you, then me, and we started working together, and then I’ve seen Ezra join your SilverCircle and take off, and I almost wonder if you’re like a rite of passage or a lucky rabbit’s foot, or you need to like somehow bow down to James and like pay homage and then like something huge happens. I don’t know what’s going on here, but I feel like you have a magic touch in a lot of ways. I don’t know if you’ve done this on purpose, but in a lot of ways you’ve kind of like parented the next generation of Internet marketers in this space and it’s really cool to watch that happen. James: Well, that’s really kind. I guess in response to that I’d say that my general management experience where I used to hire people and teach them how to sell and then nurture them through their career was a good practice ground for that. Twenty years of that, and I got my skills there. But you know, it also should be said, like I’ve just asked you to do something extraordinary, there’s 2,500 people downstairs at this traffic and conversion summit which Ryan and Perry put on, and I just asked if you could put aside a little time for chat, and you’ve kindly done that. So there’s all those people there but you serve your brand and you serve the broader leveraged opportunity like a true visionary founder, so I think this is wonderful for our audience, who get to find out this stuff. But it is a fascinating journey. It’s kind of like we’ve documented it through our series of interviews, from interview number one right through to when you came down to Sydney to our event, and then the subsequent stuff. Like you’re in… This is going to be a big year for you, 2014. And I’m very excited about where it’s going to go. And I think you answered one of the biggest questions I get asked about my Own The Racecourse training, is how to get ideas for your content. And it seems like you could never run out of doing frequently asked questions or tutorials or demonstrations, if you have anything that could be demonstrated. Clay: Yeah. I mean I think one of the great things about having a community or a platform or some sort of like active laboratory is that it produces fodder for content. So, for example, at any given time there are several hundred split tests happening on LeadPages. So if we can find a good one every day and publish that case study, and then organize it by industry, somewhere down along the line that’s going to be a great archive of what works and what doesn’t on an industry-by-industry basis. And as we add templates, that’s a great thing to profile. We give those away. Q & A, it’s the same thing, people are always asking good questions. We’re always releasing new features. And I think so many companies with their blog either go too general, or they go too specific. So you know, a company that produces cars might write some general article about car safety, and it really isn’t relevant to most people reading the blog. Or they could go very, very specific and sell the living crap out of the safety features of their new car. And I think both of those are the wrong way to go. I think that there’s this beautiful middle road where you talk briefly about what people should be thinking about and how to think about car safety, and then you also talk about how you’ve absolutely met those needs. And so you’ve at the same time provided content that people are going to absolutely learn from and benefit from. Whether or not they purchase your car, you’ve given them some criteria. But then you’ve also, you know, for your customers, and for the people who need help making a buying decision, you’ve helped them out there. And so I really think that’s kind of the content sweet spot. At least it has been for us. James: Yeah, I like the whole power of that sort of demonstrating products and features… And you give away templates for people who don’t want to buy the product, which is super smart. And then you show them how it can be done so much more easily with your software. The best thing is it talks to your existing customers as well as potential customers. So it really encapsulates this lifetime customer value, the CRM we hear about, customer relationship management. Now of course, it wouldn’t be a proper show with Clay unless you tell me some tricky data stuff. Now recently, you announced some information from your data set that was aggregated across… Not naming any specific customer, but what were some of the key insights that you’ve learned from having a couple of million opt-ins going through the system every month? Clay: Yeah, you know, a whole bunch of stuff. I’ve looked at a whole lot of split tests. I think one of the most interesting and robust split test findings is that, generally speaking – and I haven’t seen an exception to this, I’m not saying it can’t happen, but generally speaking – any kind of split test where a raw image is tested against a professionally shot image, the raw image wins. That’s one interesting thing that’s informed by our multiple split tests, that’s not like, hey, I saw this one dude do this the other day. This is like, a number of split tests confirmed this. Another really interesting finding with split tests is related to point of view on button text. And this is something that almost everyone gets wrong. So I was speaking yesterday at the Internet Marketing Party, and I just asked everyone, “Which button do you think would work better, Download My Report, or Download Your Report?” And the one that always wins that is the one that is taking the point of view of the thoughts people are having in their own head. So people don’t say, “I want to download YOUR report.” They think, “I want to download MY report.” And so you should write call to action texts from the point of view of someone’s thoughts as they’re reading it. And that’s again, that’s something that almost everyone gets wrong. We also looked at just aggregate, the best time of day and the best day of the week to mail. And that was surprising. Eighty percent of the weeks where we’ve tracked opt-in data, the opt-in rate peaks on a Monday, Tuesday or Wednesday. And they almost seem interchangeable. Ooh – a name check :) I’m seeing improvements across the board wherever I use LeadBoxes vs normal opt-in forms even though I thought initially “surely adding a step will lower conversions”. Shows the power of testing. Good podcast guys, as ever. Thank you Ian! I am testing them too. Loved the case study that you sent in, Ian. Thanks for sharing your data. 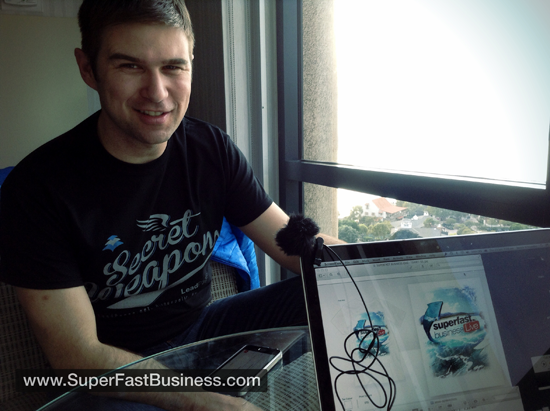 Love the Superfast LIve design James! I’m loving the design also. Thanks for having me James! I really enjoyed this one. Man, I always get pumped up when you interview Clay! Both of you are such fast paced implementors and we all benefit from your wisdom and experience. I particularly like the discussion around vision bandwidth. Clay, is it easy for you to pass off that level of responsiblity or do you stay high touch and keep a slow delegation process? Such a fantastic episode James and Clay, thanks guys! Great question, Tyler! What we do is find people who are already visionaries in the areas where we lack vision. Before they even start we co-create the vision for a particular part of our business. Once they start working with us we empower them and get out of the way. There’s still lots of training involved after someone starts (and lots of discussions to evolve our goals), but we try to empower them as much as possible from day one. Boom, such solid answers! I think I get in my own way too much and I want to work on that for 2014! Thank you James and Clay! Great convo between two great people. Can somebody help me out with something Clay says: “you should write call to action texts from the point of view of someone’s thoughts as they’re reading it” – so should it be download “my” report or download “your” report? Whose report is it? Before they downloaded it its my report after they downloaded it its theirs ;) which one does Clay say works best, “my report” or “your report”? Awesome, shirt, Greg! Thank you so much. Also, Silver Circle by @JamesSchramko:disqus is the best.